All new GLOW IN THE DARK Spy Guy Gear is now available through spreadshirt.com! Featuring a design I’ve been wanting to do for a while now. Rollover the image above for a simulation of the GLOW IN THE DARK feature. You can chose from a range of clothing styles and colours. When Diamond Comic Distributors informed the Direct Market retailers they would not be shipping comics in the fifth week of December, Jake Ekiss and friends leaped into action proclaiming December 30, 2009 – January 5, 2010 as Indy Comic Book Week! 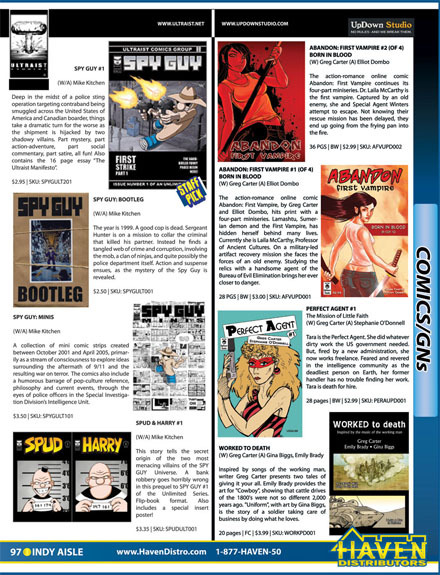 Ultraist Studios answered the call to action, by using ICBW 2009 as a platform to launch SPY GUY #1 into the direct market. As of today, over 500 comics have been shipped out to stores across the USA. For a complete list of ICBW friendly comic book shops, click here. 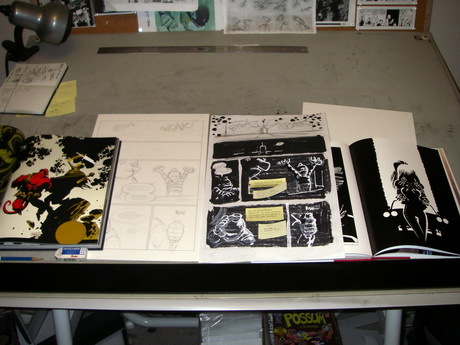 To take a look at all the other comic book creators that are participating in ICBW 2009 click here. Thanks to everyone who has come together to make this event happen. Personally, I’m excited to see how this all unfolds. SPY GUY #1 – Haven Staff Pick! In fact just yesterday, I received an e-mail from Lance Stahlberg saying some very nice things.